LOCATION.--Lat 41°19'37.9", long 73°39'21.0" referenced to North American Datum of 1983, Westchester County, NY, Hydrologic Unit 02030101, on left bank 40 ft upstream from bridge on State Highway 22 in Purdys Station, 0.3 mi upstream from mouth, and 0.45 mi downstream from dam on Titicus Reservoir. GAGE.--Water-stage recorder and crest-stage gage. Datum of gage is 199.49 ft above NAVD of 1988. REMARKS.--Flow regulated by Titicus Reservoir. Water Years 2014, 2016-18: Records fair. Water Year 2015: Records good. 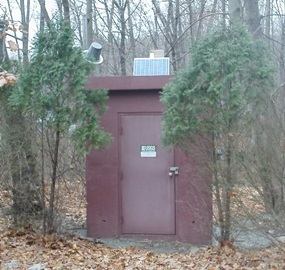 EXTREMES FOR PERIOD OF RECORD.--Maximum discharge, 2,190 ft³/s, Aug. 28, 2011, gage height, 8.75 ft; minimum discharge, 1.3 ft³/s, Jan. 31, 2002, gage height, 1.02 ft.